Frequent Parkers should look up their account before making a reservation. Park 'N Go provides PREMIUM parking for travelers! Driving from lot-to-lot to find out which is even open. Difficulty in finding a space in one of the parking decks. Uncertainty of when another shuttle will come around in the economy lots. Pulling or carrying your own luggage from your car to the terminal. The fear of not remembering where you parked when returning from a trip. When entering Park 'N Go, an attendant greets and directs you to a parking space. Our drivers pick you up at your vehicle, offer help with luggage, and take you directly to the terminal. When you return from your trip, a shuttle will pick-up and drop you off back where you parked. We will even give you free battery jump-start if needed. Fast & hassle free, the way airport parking should be. "No Waiting, No Walking, No Worrying." 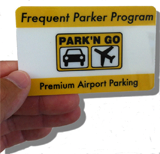 Members of our Frequent Parker Program earn points toward FREE parking for each day of paid parking. Use the online form by clicking here to join and start earning your FREE parking! To report and replace a lost card, contact the manager of your local facility. By joining the program, you may receive periodic special offers, but your information will not be shared with any third-party. If you are responsible for travel within your company and would like to set up a managed travel program with Park 'N Go, please fill out our corporate account application. A Park 'N Go Manager will contact you shortly. At Park 'N Go, the real product is convenience for the traveler!